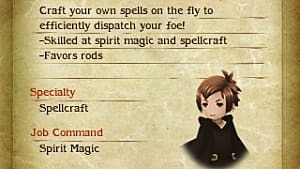 The Yokai Job is the last one you unlock in Bravely Second and has a similar quest to the Vampire Job from Bravely Default. The difference is that you don't need the complete the long quest to unlock Yokai, instead you need it to unlock the skills. I'm going to go over everything you need to get the Yokai job quest started and how to complete it. 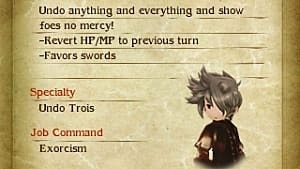 If you want general help with the game, check out my Bravely Second Beginner Tips and Tricks. 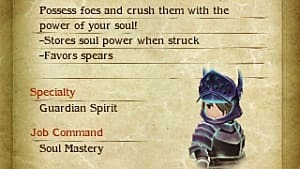 Seven Great Sins - How to unlock the Yokai skills, where each sin is located, and how to beat them. You can get the Yokai Job towards the end of chapter 6. After the events at Lontano Villa, you have access to the Job. On the northwestern part of Eternia, there is a castle you can enter. This is Vampire castle and if you come after Lontano Villa, the keystones will be lit up and you can enter. You cannot adjust the encounter rate in Vampire Castle, so you will either have to fight your way up, or run from battles. As you go up, you will learn history and truths, but you don't need to know any of it if you just want to unlock the Job. When you get to the top, there is an Adventurer for you to save and rest at before the boss fight. During the fight you will receive help periodically, I won't spoil it. I suggest using Astroligian with spellcraft. The boss uses Sloth to make you weak to all elements then attacks with the highest level element spell the next turn. Astrologian can nullify all elemental attack for your party by using Elemental Barrier with the Blast spellcraft. After you win the fight, you get access to the Yokai Job. One of the most important things about Yokai is that it raises the max Job level to 11 for every Job. To do this, you must level Yokai to 2 to unlock the Awakening support skill. Equip the skill, then level up the Job you want to level 11. After you unlock the level 11 skill, you can unequip the Awakening support skill and still have access to the level 11 skill. You only need it when you are leveling up. If all you want is to get your Jobs to level 11, you don't need this part. 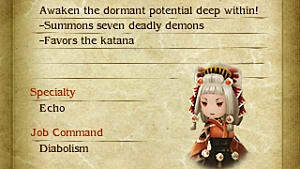 However, you need to defeat the Seven Great Sins if you want to unlock the Diabolism skills for Yokai. 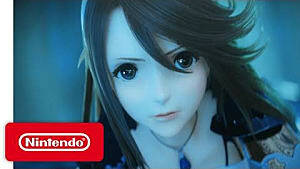 Just like Bravely Default, you must travel to each stone monument in the world map and defeat the boss there. The stone monuments are the tall gray objects. I'll go over each one and where to find them. The list will go in the order they are available in the Yokai Job. 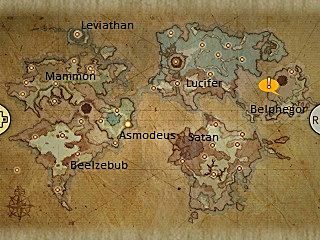 Below is a picture marked with the locations of each sin's monument. The sin of lust uses a mass charm and Thundaja frequently. 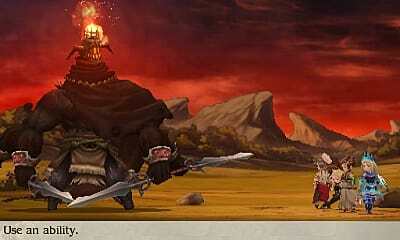 It also uses a skill called, "Call of the Infernal", which takes a party member out of battle and returns them later. Sometimes it will happen multiple times before you get a party member back. A way to nullify Charm is the most important thing to bring to this battle. Reducing or nullifying Lightning damage is also useful. The sin of gluttony uses Octowhip to deal damage multiple times to everyone in the party. It also uses Gluttony, which makes it absorb your attacks to heal itself. After 6 turns, it will use Acid Breath to deal massive damage. If you deal more damage than his max health (100,000) while he is in Gluttony, he takes all the damage and dies instantly. This is very easy if you save up BP, then hit him with attacks that he is weak against. The sin of avarice uses water attacks, so water resistance accessories or Elemental Barrier are good to use. She can use Avarice to absorb 1 BP from everyone, so be sure to save some up. 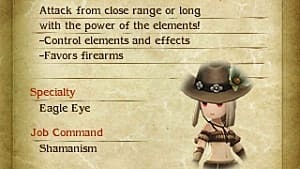 She can also reduce all your stats to increase her own. She also uses an attack called Death Claws that does very high physical damage, especially if she has the stat bonuses. 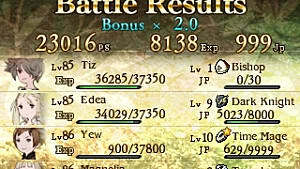 Reducing her stats and increasing your own is the way to survive this fight. Piestorm, level 11 Patissier skill, comes in handy here. The sin of sloth changes what elements it is weak and resistant to every time you hit it with it a spell it is weak against. It will absorb all other elements, as well as physical attacks, so have a team of magic users. The good news is that it cycles through only 3 elements, in this order: Lightning, Fire, Water, back to Lightning. You will need to Examine or use Magnifying glass at the beginning to see which element it starts with. The trick will be knowing how fast your party is to plan who does which attack. Sloth makes you weak to all elements, so using Elemental Barrier after will cancel it. It also summons spheres which work just like Belphegor. It is best to target all enemies so you keep them on the same elemental cycle if any survive. The sin of wrath uses a skill called Battle Blade, which does more damage the more BP he has. He also gains 1 BP every time you attack. Wrath makes all your characters go berserk, so bringing things to cure or nullify can help a lot. 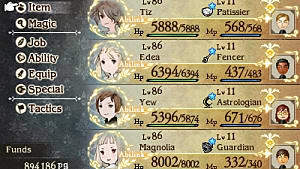 The level 11 Astrolgian skill, Status Barrier, can stop this easily. The sin of envy has two forms. The initial snake form can only be hit by magic attacks, when it switches to the ship, it can only be hit by physical attacks. It uses Envy, which will reduce all your attack and defense stats. It also uses Consume Life, which is a physical attack that can sometimes cause Death, which instantly kills you. Safety Rings are good to have since they nullify the Death status effect. The sin of pride counters every attack you do against him. If you have Soul Mirror unlocked for the Guardian Job, you can make this fight much easier. His counter attacks are all physical, so just put Soul Mirror on the person that will attack to deflect them all. If it is an attack that hits all enemies, his counter will hit all your party members. He also uses Pride, which takes away your buffs to buff himself. That's all for my Bravely Second Yokai Quest and Skills guide. Let me know if you have any questions or need further help with anything else in the game!